Are blackout curtains the right choice for you? This depends on what you are looking to achieve. It might be that you want total privacy without hindering any view or you are having trouble drifting off to sleep or being woken to early in the morning by a bright sun. Blackout lined curtains can help resolve this problem for you to enjoy that well deserved lie in. If you are a night worker, sleeping during the day blackout curtains are an invaluable feature for the bedroom or for any rooms where little ones have a nap during the day. They also have the added benefit of reducing some noise and improved insulation. Can blackout curtains keep a room cool? In short, yes. The best advice is to close your blackout curtains or blinds long before the sun starts to come in through the windows. Don’t wait until the room has already heated up. That means east facing windows should be covered first thing in the morning, to avoid the early morning light, and west facing before the full afternoon sun. 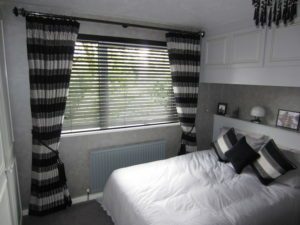 Made to measure blackout curtains in Surrey. You’ve probably seen this type of curtain in hotels and guest accommodation and you might be thinking they look a bit bland and heavy – in fairness they do! What Curtain Creation offer is very different – You can choose from any fabric, colour or pattern. The blackout lining is then fitted to the reverse side to keep out the sun. Do blackout curtains really work? There are a number of factors to take into account answering this question. With made to measure curtains you have the added benefit of a more accurate fit than off the shelf curtains. Colours and fabrics are also factors. Darker colours such as blue, brown, gray or black curtains will eliminate more light than tan, white or neutral liners. Having said that properly lined lighter, or neutral can be just as effective.